From the co-writer of cult hit Snowpiercer, comes a bold, brazen, contemporary thriller starring James Franco ('127 Hours'), Kate Hudson ('Almost Famous'), Omar Sy ('The Intouchables') and Tom Wilkinson ('Felony'). Hard luck young American couple Tom and Anna Reed fall into severe debt while renovating Anna’s family home in London. As the couple faces the loss of their dream of owning a house and starting a family, they discover that the tenant in the apartment below them has been murdered and left behind a stash of cash-$400,000 worth. Though initially hesitant, Tom and Anna decide that the plan is simple: all they have to do is quietly take the money and use only what’s necessary to get them out of debt. But when they start spending the money and can’t seem to stop, they find themselves the target of a deadly adversary – the thief who stole it – and that’s when very bad things start happening to good people. The 'Good People' competition has now closed. Winners will be announced shortly. Competition opens at 5pm AEDT on Sunday 15th March 2015 and closes at 11:59pm AEDT on Sunday 22nd March 2015. Five winners will be chosen at random on Monday 23rd March 2015. To successfully win, entrants must fulfil the above entry conditions before the time the competition closes. Current members/followers are eligible to enter the competition. Only one entry per person. Only one winner per household. To be a valid winner, the entrant must not have won a prize from SWITCH within the last 28 days. Each winner will receive one Blu-ray copy of 'Good People'. By entering, you agree to receive occasional emails from SWITCH in the future. If you decide to unsubscribe from these updates, any further entries will not be applicable. Only Australian residents are eligible to enter. 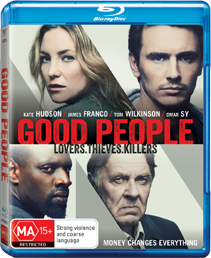 'Good People' is available on Blu-ray, Digital and DVD on Wednesday the 18th March 2015 from Roadshow.